When we start reminiscing about the McCarthy Family’s sprawling kitchen remodel in Plymouth, Michigan we go into character overload! 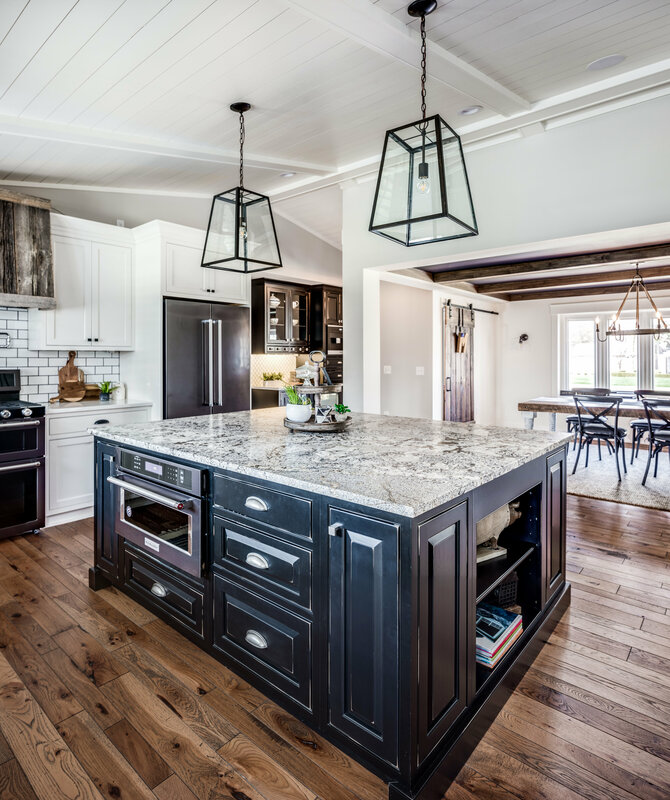 From the oversized distressed island, the rustic wood shelving and custom range hood, shiplap ceiling and black and white classic design it’s nearly impossible for us to choose our favorite design element… keep reading, we’d love to know yours! 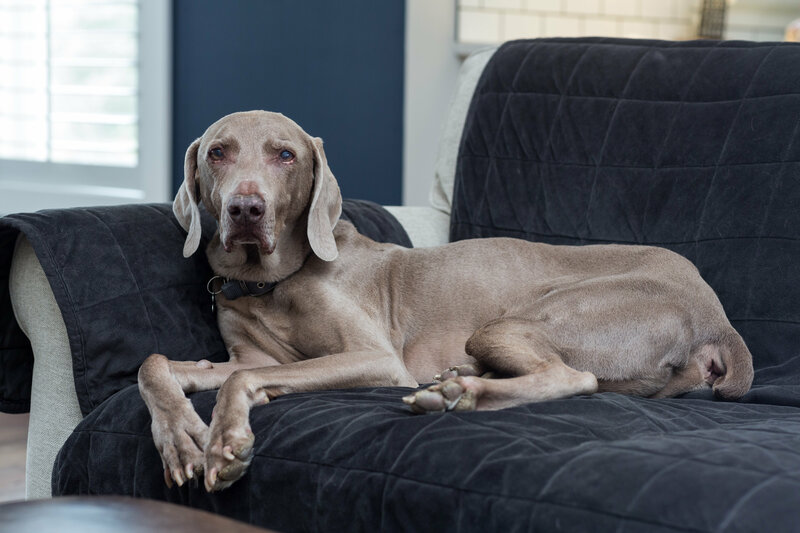 Utilizing Mouser Custom Cabinetry, homeowner Amy (who has an incredible eye for design herself!) and E.W. 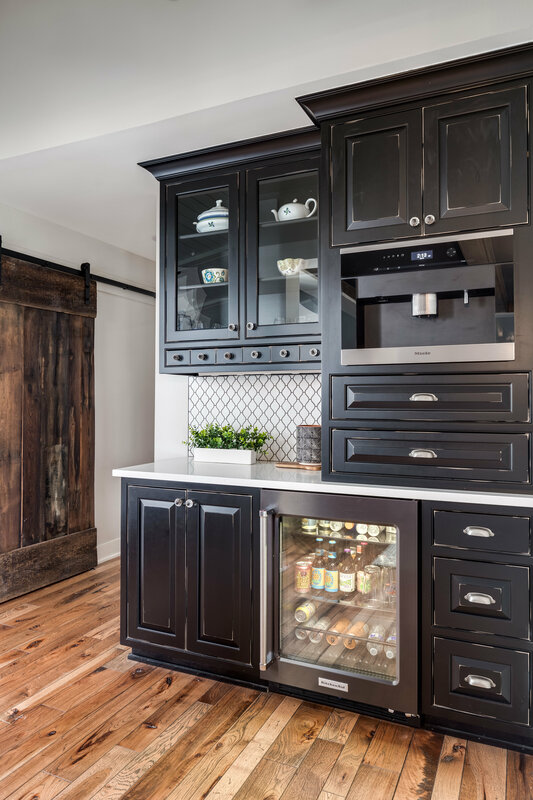 dream team designer Monica McGuigan first selected a distressed raised panel door for the island, which was painted in a rich ebony color. All elements of the island, including the distressing, deep paint color and leathered granite countertop contrast beautifully with the perimeter of the kitchen, which was intentionally kept lighter and more clean looking. This area highlights a shaker style maple door painted in Divinity, a light quartz countertop with a medium sized subway tile backsplash. Opting for a dark grout against the white tiles really enhance the classically stark contrast between the black and white colors. 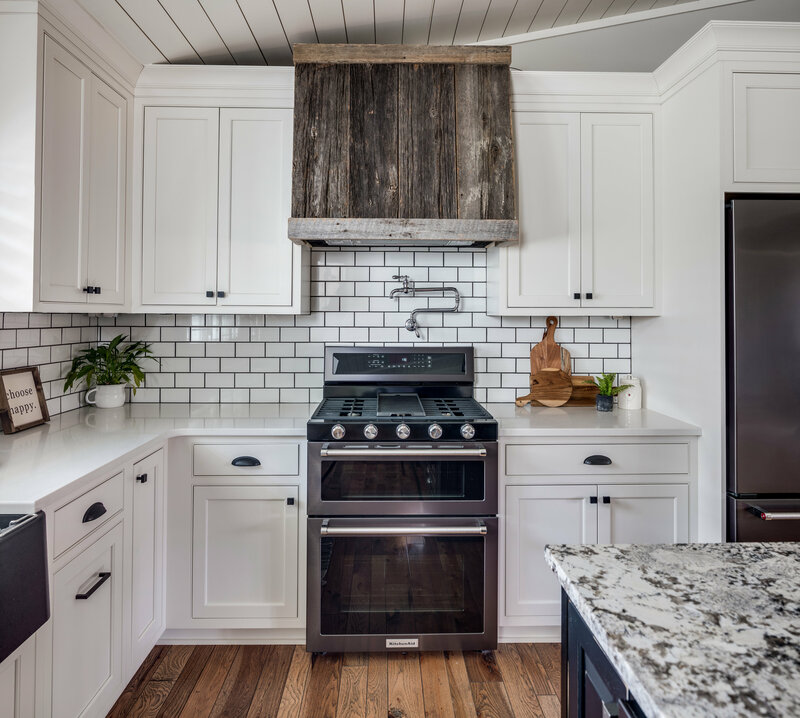 The addition of wood elements in the custom made reclaimed barnwood range hood and open shelving not only give the eye some breathing room between the white cabinetry and white shiplap ceiling, but also juxtapose the rustic feel of the distressed island nicely. On the other side of this kitchen, we also designed a coffee and beverage station, complete with the state of the art Miele coffee system and mini fridge for these beer lovers. You’ll see here in the beverage center our homeowner opted for an arabesque style backsplash similar in colors to the white subway tile throughout the rest of the kitchen. We like her style! Some people believe using black cabinetry in a kitchen is a commitment too big to risk but we believe otherwise! As this incredible space shows, there are plenty of ways to keep black cabinetry feeling light, bright and just plain classically beautiful for years and years to come. Cheers, McCarthy family!